June Osborne is the 72nd Bishop of Llandaff and lives in Llys Esgob, the Bishop’s residence on the Cathedral Green in Llandaff. 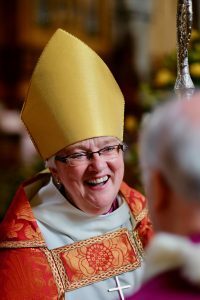 Born in Manchester June served in the Dioceses of Oxford, Birmingham, London and Salisbury before becoming Bishop of Llandaff on 14th July 2017. As Deaconess since 1980 she was ordained a deacon in 1987 and was then amongst the first women to be ordained priest in the Church of England in 1994. From 2004 to 2017 she was the Dean of Salisbury. Bishop June is married to Barrister Paul Goulding QC, who was born in Cardiff and has two children, Megan and Tom. She is a lifelong supporter of Manchester City and a member of Cardiff City FC. Her rugby allegiances are undivided and she always supports Wales.